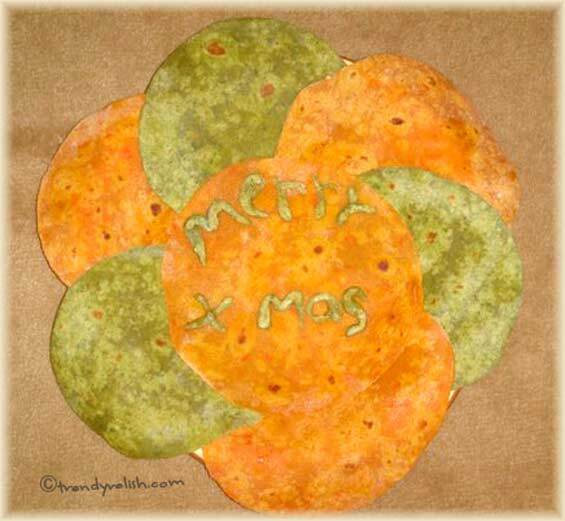 These are delicious and colorful chapathis perfect for the Christmas. Mix wheat flour, olive oil and salt. Make puree of red bell peppers and add it to the wheat flour mixture. Add water if necessary to make nice and smooth chapati dough. Let it stand for an hour. Divide into lime size balls and roll out the chapatis. Shallow fry them on a pan. Add spinach puree instead of bell peppers and follow the above recipe. This recipe is reaching "Let's Cook For Christmas, Red and Green" event, hosted by Simply.Food. Thanks for the invitation Simply.Food! Chapatis look so tasty and vibrant. Excellent recipe. red colored chappathi is very new to me. will try sometime..
healthy and delicious chapathis..red chapathis are new to me.. Healthy and delicious chapatis. Merry Christmas and Happy Holidays!